Downtown apartment Dajana is located in the very center of Zadar old town. It provides an excellent location as the sea is only 200 meters away, town's best restaurants are just down the street and there is a grocery store a few steps away from the entrance. First floor accomodation is consisted of 2 separate apartments with common entrance. It can accomodate up to six people offering 2 bedrooms, 1 spacious living room, 2 kitchens, 2 modern bathrooms and one toilete. Spacious living area offers an extraordinary view on the medioeval church of st Donat and the Roman Forum. The world famous Sea organ is 200 meters away and the city's vibrant main street is just next to the entrance. 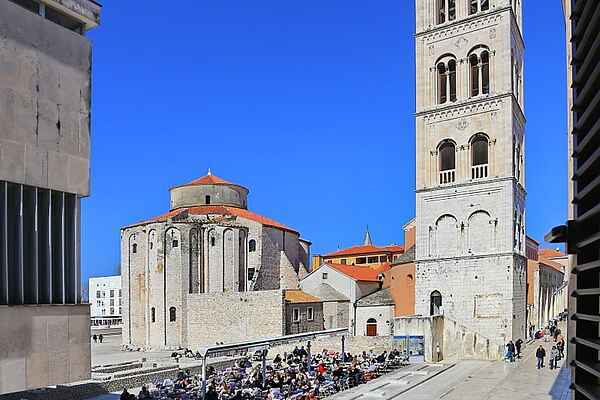 All of Zadar's main attractions can be reached in a 5 minute walk and the neighborhood is unique as it is a combination of old squares, narrow streets, cafes, restaurants and small shops. Zadar archipelago counts 24 bigger and 300 smaller islands and excursions from nearby dock are organized on daily basis. Also, Zadar is surrounded by 3 Nature parks and 5 National parks: Kornati islands, Plitvice lakes, Krka, Paklenica and North Velebit which classify Zadar as one of the most attractive tourist destination in Croatia.